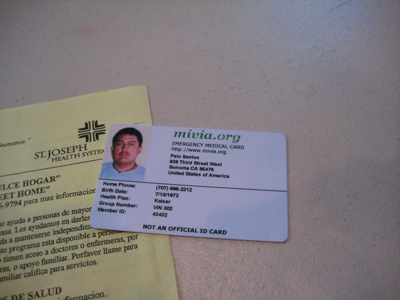 Yesterday, I wrote a post about my visit to Sonoma, California, and the health care that MiVia is enabling. Heidi Stovall then gave me a tour of the application, and allowed me to take screen shots of it to post here. 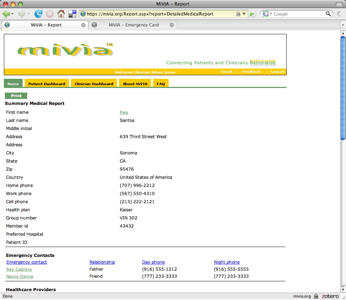 All of the information in the screen shots are not from real patients, so there is no personal health information being displayed. Let’s take these one by one. And here are the images that go with the tour. 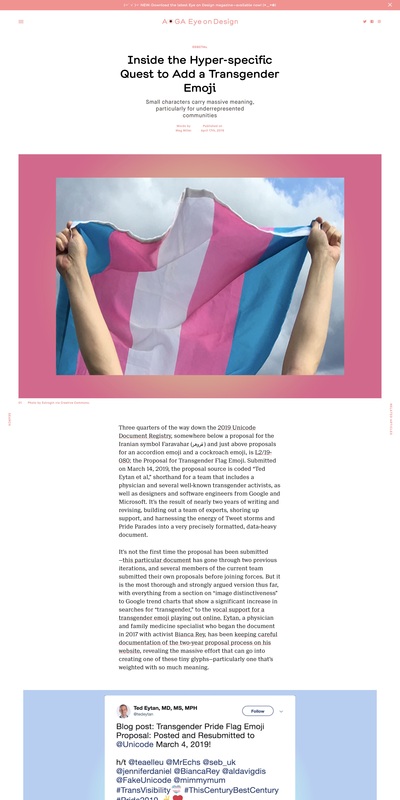 Click on any to see full size. 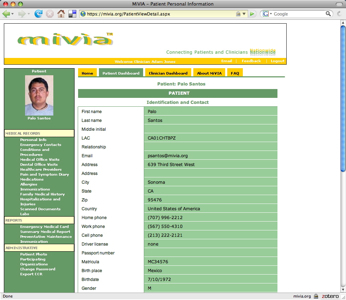 This is the patient login, and includes their identification screen. Notice the LAC. That’s a “Limited Access Code” and allows a selected person access to the information, for example a care provider in an emergency. A chart note. 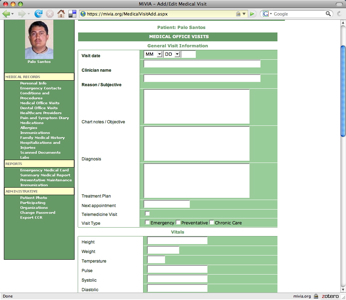 This allows a provider to document right into the patient’s personal health record. An interesting paradigm – the customer of this system is the patient, not the provider (sort of how I think these systems should be designed). Important to remember that these patients typically do not have medical records in other EHRs. 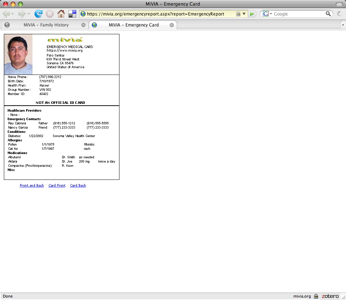 The printable ID card. I mentioned yesterday that this is not an actual ID, but to the users, it signifies “belonging” to something. At the same time, it can be given to a provider to signify that “there is a place you can go to learn about my medical and dental history.” It’s worth noting that my health plan offers this, but via a telephone service, not through the Web (I can access my own information, but I do not have an access code I can give to someone to do it for me). A medical summary report. A easy place to find out about a person’s medical and dental conditions. Sharing preferences. 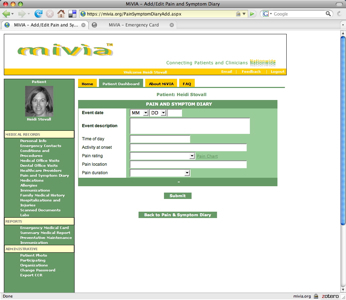 The patient can automatically add their record to the roster of a participating provider. If they do not add this, the provider can also add the patient by getting access code information. Again, the heritage of a patient-centered application is apparent. I think this looks very simple and understandable. Pain and symptom diary. What’s significant here is that the patient-centered nature of this record means that patients can document in it as much as providers can. It’s a basic interface to be sure, but physicians know that a cornerstone of pain management is for patients to document what they are feeling. Dental Records. Again, a basic interface, but it’s a bit of a breakthrough in my experience to combine oral health and general health in one place. From the patient perspective this makes total sense. 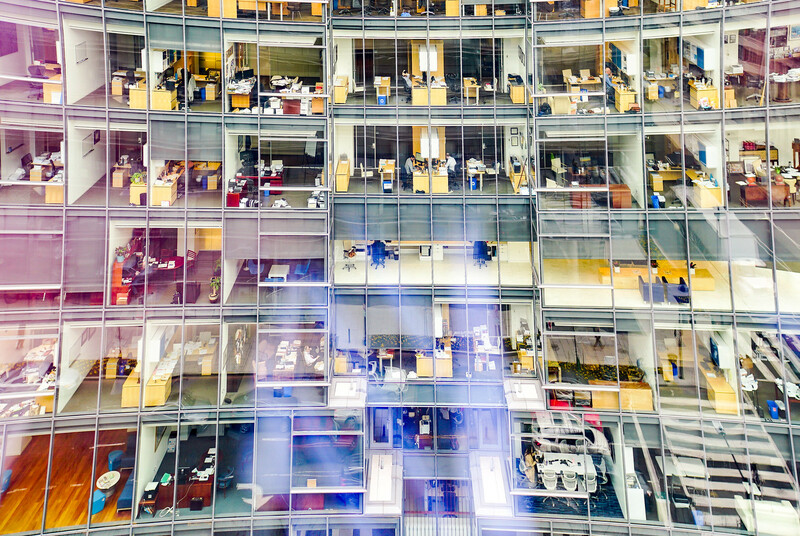 From the physician perspective, we are used to segregating “medical” and “dental.” Why? Tradition? Because we went to different professional schools? I think the patient’s way is the best way. CCR Export. I think this is one of the most promising features. It’s clear that this is a group of patients that are unlikely to be served by a health system with a tethered PHR, and one of our findings is that a tethered PHR is not the only way to serve patients. 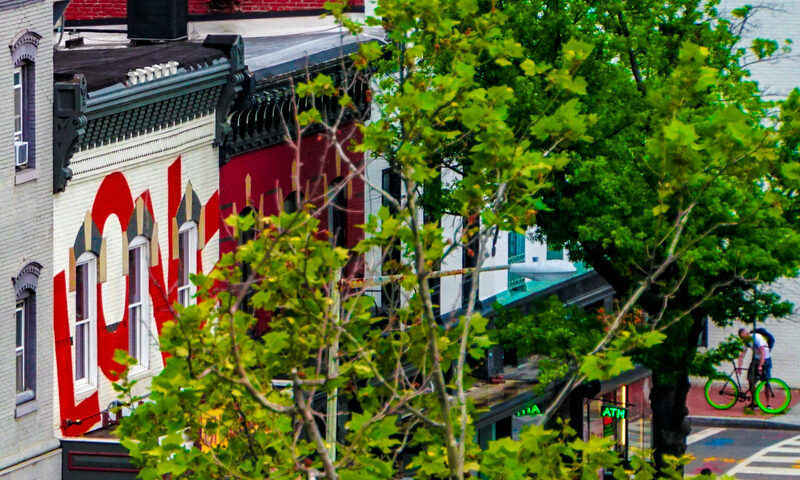 What if this subset of the community could upload their record to a tethered system, for example, if they receive care in a tertiary care hospital, or if they obtain a specialty consult in a system that has an EHR? In this case, they will still use MiVia as their portal. 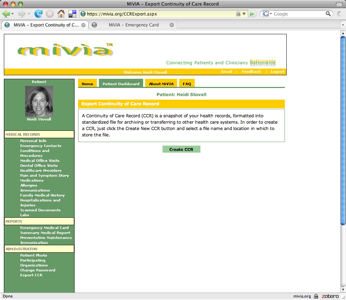 The idea is that the specialty care provider could either document here (copy their note), or send a CCR export to MiVia. Every community has patients that depend on community supported care, in systems that may or may not have robust HIT infrastructures. 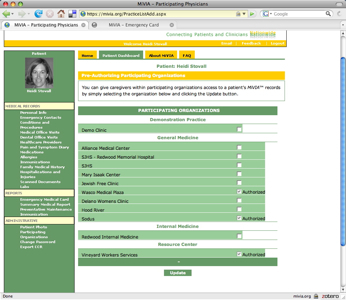 In many communities, EHRs are being implemented, in some cases with patient access over the Web. 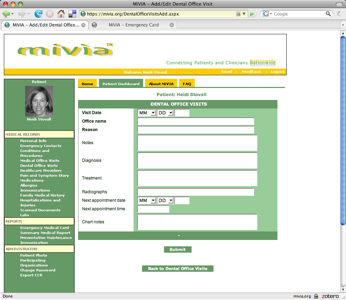 I am not sure that MiVia would necessarily replace a proprietary EHR patient access system; however, it could very much complement it. What I have learned from my experience is that health care, and the health information associated with it, should be wherever the patient is. It sounds obvious, but what can happen is that a patient can be admitted to a hospital, where a medical record is created in one electronic system. The patient can then be discharged and then another medical record is created in the outpatient setting, which is counter to the idea of medical information following the patient. What if the person and family are not regular users of these settings? Who will put their medical story together? Going back to the story at the beginning of yesterday’s post – what if you did see that doctor who may not speak your language, or you wondered if anyone knew if you needed preventive care. If you could give them a card that said, “It’s all here,” maybe providing for yourself and your family might be a little less scary both for you, and for the health care professionals that want to keep you well. I really liked the MiVia tour. I have been using FollowMe for all of my 88 year old mothers medical records. It has made all of her medical care so much easier. 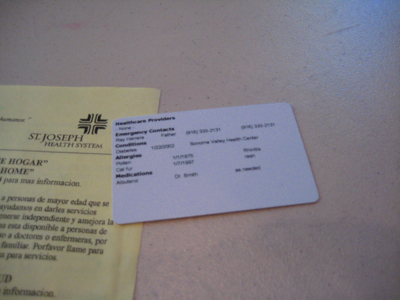 No more pages of informantion to fill out every time we go to the Doctor. I just print out her medical history and take it with us. Easy to update and easy to use. That's great to hear. Can you tell me more about how you use these tools for managing her health in terms of specific examples of the tools and interactions with her clinicians (I'm not asking you to share any confidential personal health information). My mom has health issues related to her heart. Her Doctor frequently does tests and changes her meds. When there is a change or procedure, I update her history on FollowMe. A good example: About 5 months ago, my mother went to the Emergency Room complaining of shortness of breath. It was at 11pm. I met her at the emergency room with all her current meds and history printed from FollowMe. It saved time and paper work. Her visits with her Heart Specialist, procedures that were done at another Hosp.,it was all there. The Emergency room Doctor thanked me! Fortunatly the visit turned out fine.